I remember once when a group of my friends asked the question: who is your favourite Muppet? Some said Animal or Miss Piggy, others said Statler and Waldorf. I said my favourite is Rowlf the Dog. No one mentioned Kermit. I have asked that question a few more times with other groups, and again almost no one says Kermit. When I mention that, suddenly people amend themselves. Loving Kermit seems to be the default. So, everyone thinks of their second favourite Muppet first. 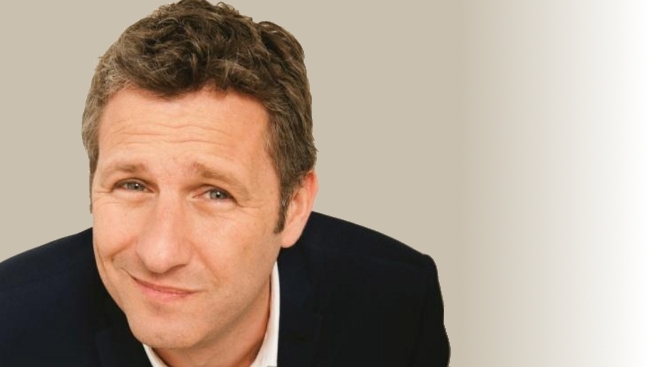 After reading Adam Hills’s press release for his new show Happyism, I’m convinced he is a default favourite, which is why he has been nominated for various awards a bazillion times without winning them (“He doesn’t need the award, everyone already loves Adam”). I have seen several of Hills’s shows and they all follow his personal formula, they all exemplify his outlook on life, and they are all exceptional. They may have different stories, different audience conversations, but you know what you are getting into when you go to a Hills show. He also sets the bar for stand-up comedy. For this review I will primarily go over what I feel makes his comedy work. Well of course, he’s not a robot. But what I’m trying to say is, he’s not an infallible god or perfect angel either. He speaks of his own weaknesses and fallibility. He allows himself to be seen, warts and all. He’s not above a bit of body humour or silliness. He swears affably. He’s not a snob nor an anti-snob snob and removes barriers to enjoyment for all of his audience members. In comedy we all like our audiences for their attention and money, but he goes beyond that and takes an interest in them. As such he is comfortable with improvisationally speaking with individual members of his audience. People in part enjoy his shows because it is often as much about them as it is him. He knows how to mold an experience into a story. He picks only the most relevant events, he brings them to life with engaging details, he builds the scenario with well-paced rising action, then he turns our understanding of the story inside out with a surprising and insightful climax. Any stage of this process may seem easy, but it involves long years developing skill and comic taste to bring it all together effectively for an audience. Optimism is highly underrated in our culture, but clearly people are craving it. Hills’s philosophy of acceptance and validation of others humanity creates a solid basis from which to build consistently funny shows. Tim Minchin actually does the same thing, but from a cynical position. A strong philosophy gives a show focus and thereby definition. Happyism covers subjects such as the Muppets, the Dalai Lama, Aussie ockerisms, and regrets around a mean joke. But mostly it’s about seeing the world in a more generous manner. After all, how can you change the world if you don’t love it first? PS: Dear Adam Hills, I have been trying for over a year to get an interview with you, sending your agent a reminder of my interest every few months. When are you free for a cuppa?